A limited edition commemorative $40 note has been launched today by the Central Bank of Solomon Islands to celebrate the country’s 40th anniversary of independence. Designed by De La Rue and printed on De La Rue’s Safeguard™ polymer substrate, the new note will be issued on 7 July to coincide with the special anniversary. It will be the fifth note in the new family, following on from the launches of the $10, $20, $50 and $100. The theme of the note is a celebration of independence with the phrase ‘A call to the nation to come together as one and move forward’. The innovative note is unusual because it has a vertical front design and more conventional horizontal back. On the vertical front of the note there is a stunning image of a man blowing a conch shell. The conch shell is an instrument used as a traditional form of trumpet, summoning people to gather and signalling the start of important events. A stylised map of all the islands is a symbol of nationhood and inclusion. On the back of the note the national flag can be seen in the background, overlaid with images of traditional fishing and canoe travel, diving and marine fauna. There is a very limited number of notes being produced – just 100,000 – so they are guaranteed to be in high demand. This collaboration continues De La Rue’s long standing relationship with the Solomon Islands that dates back to 1916. Speaking on the occasion of the launch, the Governor of the Central Bank Denton Rarawa said: ‘We are proud to be marking our 40th anniversary in such a significant way and are grateful to De La Rue for their continued assistance with many aspects of our currency and currency management’. 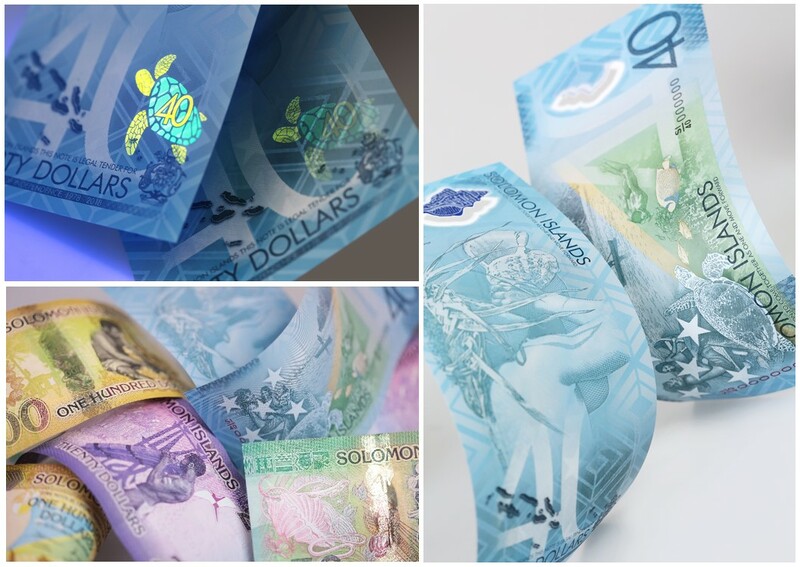 De La Rue’s Global Sales Director Ruth Euling said: ‘De La Rue is delighted to be partnering with the Central Bank of the Solomon Islands once again, especially on this special occasion to celebrate the 40th year of the their independence’.